Tap the image for a short history of McCrory's, Woolworth's, and the lunch counter sit-ins in Rock Hill, SC. 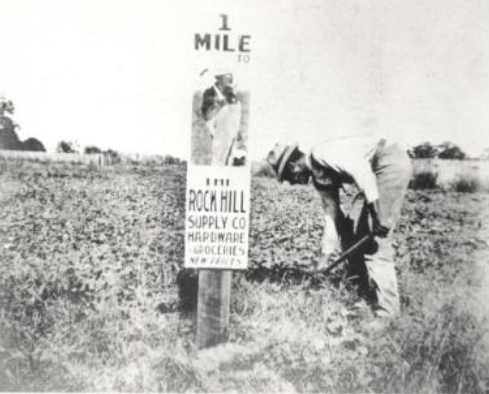 One of Rock Hill's first lots, this was originally used to house the early merchants store of Allen & Barber. This lot was purchased by Captain W.L. Roddey from A.T. Black in 1867 for $400. Roddey then sold the property to Ferguson H. Barber a year later. Barber, a highly successful merchant, built a large frame storehouse here and then took into partnership John R. Allen, creating the firm of Allen and Barber. Barber, who was the first mayor of Rock Hill, also erected a large frame residence on a portion of this lot. Interestingly, the western line of this property has remained the same since it was first laid down in 1851. An early image of East Main Street prior to the construction of the dime store. After a few years the Barbers moved to a larger residence on the corner of Hampton and Main Streets and the Allen’s acquired the former Barber house as their home. Following John R. Allen’s death the property was sold off in sections. A portion of lot 5 was bought by James S. White who built a two-story building for the Rock Hill Supply Company, and was in later years the McCrory building. The remaining portions were sold to William Crosby, James S. White and the Barber heirs. A large brick building was eventually built on the combined portions becoming the F.W. Woolworth Company. The Herald reports several changes for this land throughout the 1920s and 1930s including a Building Loan Association, the Moore-Sykes Company, a millinery business and the Prudential Life Insurance Company. In 1935 Woolworths reopened in a new building following a fire the previous year. In 2015 the Woolworth Building was demolished to make room for a new apartment complex on Main Street.